Here we are in the time of our aging baby-boomers. Studies are being conducted and nonfiction tomes being released, assessing the sociological effects on our culture and the preparedness of our healthcare systems. Stewart O’Nan has painted the most evocative picture of all in his sequel to Wish You Were Here. 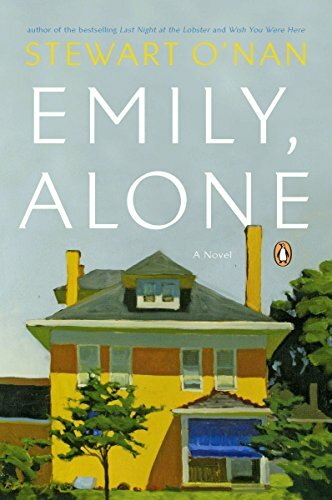 If you have watched a parent or grandparent experience aging or have stood by anxiously as their health fails, be warned that Emily, Alone will give you pause and many uncomfortable moments. Emily, surviving mother of a son and a daughter, grandmother of four, has lived another eight years since losing her beloved husband Henry to cancer. Wish You Were Here chronicled the final family vacation at their cabin on Lake Chautauqua following Henry’s death. In that novel, the reader gets to know this family intimately with all of their shared history and issues. Reading it first adds considerable depth to the new novel. In November of her 80th year, Emily sets off with her sister-in-law Arlene for their weekly breakfast at Eat ’n Park’s two-for-one buffet. Arlene drives. Emily has clipped the coupon from the Sunday Post-Gazette. Emily is terrified by Arlene’s driving but is more terrified to drive herself. If Stewart O’Nan did not write so close to the bone, these two women and their mishaps would be comedic. Somehow Jonathan Franzen makes this sort of thing funny, but that is not Mr. O’Nan’s way. We go through winter and spring with Emily. She lives alone in her lovely suburban Pittsburgh home, surrounded by her furniture and paintings and china and silver, listening to classical music, and reading novels, while suffering from a debilitating loneliness. She talks to Rufus, her old Springer spaniel, who is also enduring the indignities of aging. Keeping constant lists, inventing outings, and waiting for calls from her son and daughter, get her through the days. Her doctor harries her about not eating enough but she has little appetite. The oldest woman in her neighborhood, attending funerals of friends and lifelong acquaintances is a constant in her life. Thanksgiving, Christmas, Easter, and the yearly family vacation on the lake keep her going. Even those blessed events are fraught as her son and daughter make their plans at the last minute, the weather interferes with their timely arrivals, and the grandchildren don’t appreciate their gifts or the outings she arranges for them. Having been raised to write thank-you notes for every gift, she waits daily after Christmas for the mail only to be disappointed when those grandchildren do not write. When Arlene faints at Eat ’n Park due to having skipped breakfast at home, Emily overcomes her fears and drives to the hospital daily while Arlene is having tests. Then Arlene visits daily, cooks and fusses over Emily when she gets strep throat. Through it all, they bicker as they try to be grateful for each other. It is all so real and true to life: their conversations, their views, and their approach to everyday matters. Do we really have to read about it? Well, of course, no one has to read Emily, Alone. It is possible that a reader could reach a deeper understanding of the stages of life or of the ways that we visit the sins of our parents on our children or of the folly of holding on to outdated patterns of living. When it comes to showing us to ourselves, Stewart O’Nan is a master.